The eggplant, or aubergine as it is called in France, is a vegetable valued for its taste and texture. 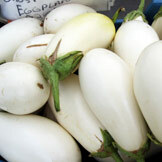 However, early varieties of eggplant didn’t have the same culinary appeal as they do today. Due to its bitter taste, Europeans tended to grow eggplants for their decorative properties rather than their culinary use. It wasn’t until new varieties were developed in the 18th century that the eggplant lost a bit of its sour flavor and reputation. One of the most popular varieties of eggplant in North America is ‘egg-shaped,’ with its glossy, purple skin. In addition to this variety, eggplants come in a range of other colors, like lavender, jade green, orange, and yellow-white, as well as in sizes and shapes that range from a small tomato to a large zucchini. When choosing eggplants, pick those that are heavy for their size with skin that is smooth, shiny, and brightly colored. To test the ripeness, gently press the skin with your thumb. A ripe eggplant will spring back and not leave an indentation. Unwashed eggplant can be stored in a cool place or inside the refrigerator crisper for up to 5 days.